For similar structures in mucous membranes such as the colon, see Polyp (medicine). A skin tag, or acrochordon (pl. acrochorda), is a small benign tumor that forms primarily in areas where the skin forms creases (or rubs together), such as the neck, armpit and groin. They may also occur on the face, usually on the eyelids. Perianal skin tags can be associated with Crohn's disease. Acrochorda are generally harmless and painless and usually do not grow or change over time. Though tags up to a half-inch long have been seen, they are typically the size of a grain of rice. The surface of an acrochordon may be smooth or irregular in appearance and is often raised from the surface of the skin on a fleshy stalk called a peduncle. 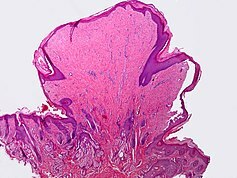 Microscopically, an acrochordon consists of a fibrovascular core, sometimes also with fat cells, covered by an unremarkable epidermis. However, tags may become irritated by shaving, clothing, jewellery or eczema. Skin tags are thought to occur from skin rubbing up against skin, since they are so often found in skin creases and folds. Studies have shown existence of low-risk HPV 6 and 11 in skin tags, hinting at a possible role in its pathogenesis although one 2012 study found no association between skin tags and low risk or high risk human papillomaviruses. Acrochorda have been reported to have a prevalence of 46% in the general population. A causal genetic component is thought to exist. They also are more common in women than in men. Acrochorda were once thought to be associated with colorectal polyps, but studies have shown no such connection exists. Rarely, they can be associated with the Birt–Hogg–Dubé syndrome, acromegaly, and polycystic ovary syndrome. Elevated blood sugar and insulin is linked to an increased incidence of skin tags through an unknown mechanism. 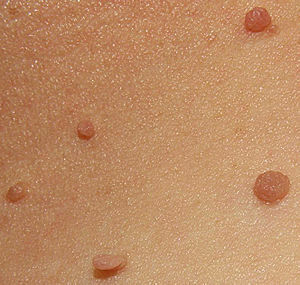 Like moles, removal of skin tags poses a threat of exacerbation of the tumorous site. Though rare, it is possible to develop a malignant tumor by removal. If removal is desired or warranted, it can be achieved using a home treatment kit, dermatologist, general practitioner or similarly trained professional who may use cauterisation, cryosurgery, excision, laser, or surgical ligation to remove the acrochorda. ^ Edwards L, Lynch PJ. Genital Dermatology Atlas. Lippincott Williams & Wilkins, 2010. p. 209. Retrieved 18 January 2011. ^ a b c "Cutaneous skin tag". Medline Plus. Retrieved 20 August 2012. ^ Gupta S, Aggarwal R, Gupta S, Arora SK (2008). "Human papillomavirus and skin tags: Is there any association?". Indian J Dermatol Venereol Leprol. 74: 222–5. doi:10.4103/0378-6323.39585. ^ Pezeshkpoor F, Jafarian AH, Ghazvini K, Yazdanpanah MJ, Sadeghian A, Esmaili H, Karrabi M, Rohani F, Joushan B (May 2012). "An association of human papillomaviruses low risk and high risk subtypes with skin tag". Iranian Journal of Basic Medical Sciences. 15 (3): 840–4. PMC 3586892. PMID 23493098. ^ Schwartz RA. "Acrochordon". Medscape Reference. Retrieved 20 August 2012. ^ "Acrochordons - Symptoms & Treatment". Womens-health-beauty.com. Retrieved 28 November 2011. ^ Brendler et. al. (June 1989). "Skin tags are not a risk factor for colorectal polyps". Journal of Clinical Gastroenterology. 11 (3): 299–302. ^ "Acrochordon (Skin Tag, Fibroepithelial Polyp)". Thedoctorsdoctor.com. 1 December 2008. Retrieved 28 November 2011. ^ Tamega A, Aranha AM, Guiotoku MM, Miot LD, Miot HA (1 January 2010). "[Association between skin tags and insulin resistance]". Anais Brasileiros De Dermatologia. 85 (1): 25–31. PMID 20464083. ^ Manchanda, Yashpal (2 August 2018). "Removal of skin tags with Erbium:YAG Laser: A simple, safe, quick, and effective technique requiring no local anesthesia". Journal of the American Academy of Dermatology. 79: AB244 – via Elsevier Science Direct. This page was last edited on 14 March 2019, at 21:56 (UTC).